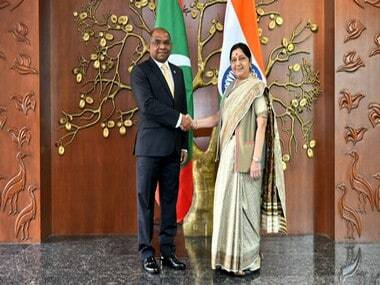 New Delhi: External Affairs Minister Sushma Swaraj on Monday met her Maldivian counterpart Abdulla Shahid to "deepen" bilateral cooperation and ensure peace and security in the region. This is Shahid's first visit after assuming charge as foreign minister of Maldives and assumes significance as the ties between both the countries had severely strained under the previous government in the island nation. "Working together to fulfil the developmental priorities of Maldives. 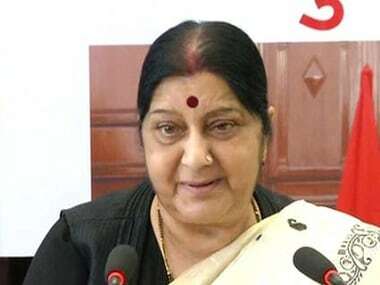 EAM @SushmaSwaraj and FM of Maldives @abdulla_shahid had a warm and productive meeting on deepening bilateral cooperation and to ensure peace and security in the region," MEA spokesperson Ravish Kumar tweeted. 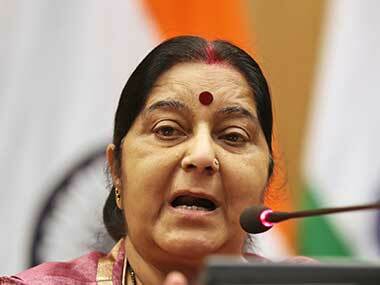 Earlier, Swaraj had "warmly" received Shahid and also congratulated him on his appointment as foreign minister. "Harmonious synergy of India's 'Neighbourhood First' & Maldives 'India First' policy. EAM @SushmaSwaraj warmly receivd (received) Foreign Minister of Maldives @adbulla_shahid on his 1st foreign visit to India. EAM congratulated FM Shahid on his appointment as new Foreign Minister of Maldives," Kumar tweeted. Prime Minister Narendra Modi had attended the swearing-in ceremony of Maldivian President Ibrahim Mohamed Solih on 17 November in Male. Solih, as the opposition Maldivian Democratic Party's candidate, had surprisingly defeated strongman Abdulla Yameen in the presidential election held on 23 September. Some decisions by Yameen including imposition of restrictions on work visas for Indians and signing of a new Free Trade Agreement with Beijing also did not go down well with New Delhi. Relations between India and the Maldives slumped further after Yameen imposed emergency on 5 February this year.